Have AOC changes affected your business? 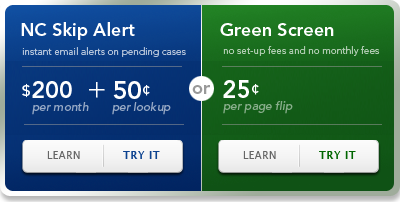 We now offer two solutions for our bailbonds customers. NC Skip Alert is an online service that provides our Bail Bonds customers with the ability to track offenders that have skipped on their bail. Simply enter the case number and county that you want to track. 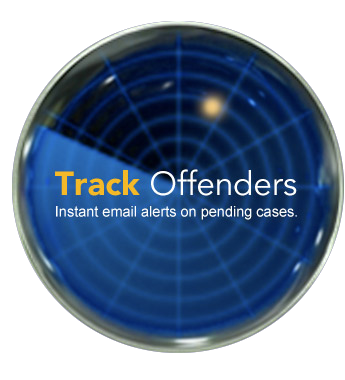 If the defendant gets a new court date or is re-arrested you are notified by an email alert. Just log in and check match activity. In pending cases where judgments have been entered just click on the case to print the judgment and discharge. This web based application tracks and monitors all pending liability as well as specific forfeitures that are entered by the client. After entering the data just one time a bondsman is able to keep up with all pending liability as well as the current status on bond forfeitures. If pending cases change for any reason an email alert is sent to the bondsman.